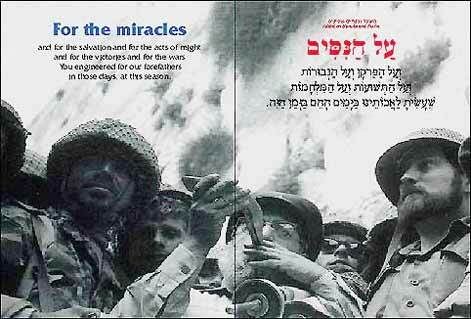 Fifty years ago, yesterday, in one of the most important anti-jihadist days in history, Israel responded to Muslim enemies on all sides who beckoned it to war. 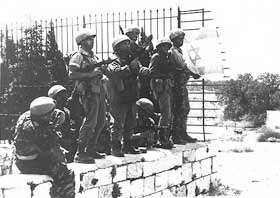 On the morning of June 5, 1967, the Six Day War began and with it, yet another important battle against Islamic terrorism. Israel had no choice but to go to war in a preemptive strike because Egyptian leader Gamal Abdel Nasser announced he would attack Israel. Inevitably and predictably, all of the neighboring Arab Muslim nations joined forces and ganged up against Israel. 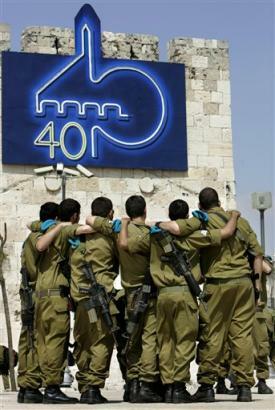 But like the Maccabees, the Israelis beat these larger, more numerous forces. And they did it in just six days. Because these “neighbors” (who were anything but neighborly–and that remains to date, even with Egypt and Jordan with whom Israel has very cold “peace” pursuant to treaties and incongruous land concessions) went to war, they all lost. Israel ended up with the so-called “West Bank” (Judea and Samaria), Gaza, the Golan Heights, and also heroically re-united Jerusalem, the eternal Jewish capital. It should be noted that prior to Israel gaining these lands because its neighbors went to war, there was no Palestinian state in any of these lands. No Palestinian state in the “West Bank” or East Jerusalem, both of which had been part of Jordan; or in Gaza, which was part of Egypt. Nor were there any movements to make any of those lands into a Palestinian state. Yet, the P.L.O.–which was founded in 1964–was in existence to make a Palestinian state in the little sliver that was Israel at the time. Israel annexed the Golan Heights, and it should have done the same with all of the West Bank. It should also be noted that when Israeli soldiers liberated and re-united all of Jerusalem on June 7, 1967, they found the sites of the Jewish Temple and Temple Mount–the holiest sites in Judaism–filled with garbage and other refuse. This is the same portion of Jerusalem that is now claimed as “the second [or third–I lose track of their lies] holiest site in Islam”–an area they neglected and filled with garbage. In the last two weeks, leading up to the anniversaries (both yesterday’s beginning of the Six Day War and tomorrow’s capture and reunification of Jerusalem), I’ve read plenty of stories from the mainstream (read: anti-Israel) media, including Associated Press, claiming that Israelis are upset they won the war–that they are upset they got the West Bank and the reunification of Jerusalem and that they are upset about having to deal with the Palestinians. This is absurd. What should Israel have done? Given up and said, “Okay, you Muslims want to wipe the Jews off the map. We give up. Just kill us”? AP probably wouldn’t mind that. But Israel’s recapture and reunification of Jerusalem–one of the most moving moments in contemporary history, with Israel’s Chief Rabbi Shlomo Goren sounding the shofar–was a great event and achievement. So was its capture of the West Bank and Gaza and the Golan. Israel’s only mistake was allowing its Muslim Arab population to remain. Israel should have immediately sent them all packing forever (just like the Muslims did with their Jewish populations, especially in 1948 and thereafter). Now, it is too late. Israel doesn’t have the guts to do it and the world won’t let it be done, anyway. Instead, Israel allowed Palestinians to fester in, immigrate to, and reproduce like rabbits in Gaza and the West Bank. And, now, it has two Muslim hellholes on its borders in addition to the hellholes that already existed. And Israel has multiple Muslim Arabs in its midst, too. This is another area in which it should have imitated its Muslim Arab neighbors. It should have kicked them all out and refused them citizenship, residency, voting rights, etc. Now, it is too late for that, too. If you asked Israelis their regrets and they were honest, I guarantee you they would repeat what I just said above, not lament getting back the holiest Jewish sites and gaining stability for their country. 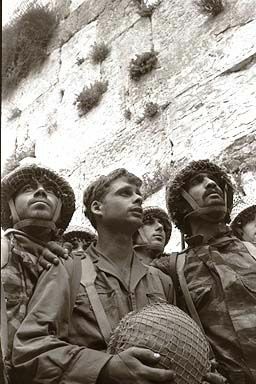 I doubt there are any Israeli Jews who regret the valiant win of the Six Day War, 50 years ago. 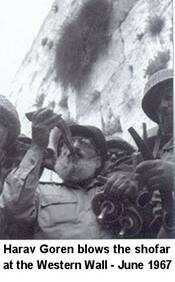 This is and was a tremendous source of pride, not just to Israelis, but to Jews around the world. The Israelis not only liberated Jerusalem, but they stopped Muslims from using Jewish graves as toilets and urinals and building hotels on top of them in disrespect to the dead. The Jew-haters all over took note of the Six Day War victory and lessened their physical attacks on Jews. They saw that Jews are strong. That we fight and we fight back. That we win. And that we embarrass our enemies, particularly the most lethal ones we’ve had in history: the Muslims. When Jews are strong–when Israel is strong–anti-Semitism goes down. That’s why it is up to historic highs now. We are weak. And Israel is weak. The Six Day War was a win. But, lately, Israel’s wars–against Hezbollah, against HAMAS, against worldwide media hatred and negative pulic opinion–have been a draw and ultimately a loss. Make no mistake, the Six Day War and the reunification of Jerusalem were high notes in Jewish history, not the lamentation and regret the media would have you believe. Here is what I wrote ten years ago, on the 40th anniversary of the Six Day War. All of it applies and holds true today . . . .
On the morning of June 5, 1967, the Six Day War began. It is one of the most important battles in anti-Jihadist history and the War on Terrorism (which, here’s a clue, started well before 9/11). Israel’s victory in this war enabled it to reunify Jerusalem and capture Sinai, Golan Heights, Gaza Strip and West Bank (none of which were then “Palestinian”). On May 22, Egypt closed the Straits of Tiran to all Israeli shipping and all ships bound for Eilat. This blockade cut off Israel’s only supply route with Asia and stopped the flow of oil from its main supplier, Iran [DS: that was when Iran was run by the Shah, one of our friends and a relative good guy compared to what replaced him]. In April, just two months before, Syrian soldiers attacked Northern Israel, and a huge contingent of Syrian troops amassed on its border with Israel, signaling–and its leaders verbalizing–that it was ready to join Egypt’s war on Israel. Israel repeatedly tried to negotiate peace with Egypt and its other Arab neighbors, but like today, they simply weren’t interested. As Nasser said, “The Arab people want to fight,” and that is exactly what they got . . . plus their asses handed to them. The armies of Egypt, Jordan, Syria and Lebanon are poised on the borders of Israel…to face the challenge, while standing behind us are the armies of Iraq, Algeria, Kuwait, Sudan and the whole Arab nation. This act will astound the world. Today they will know that the Arabs are arranged for battle, the critical hour has arrived. We have reached the stage of serious action and not declarations. * It resulted in the reunification of Jerusalem (which was re-captured on June 7, 1967–and which I’ll have more about, on Thursday, that 40th anniversary). Finally, Jews and other non-Muslims could pray at the holiest and most important of Jewish religious sites, the “Kotel Ha’Ma’aravi” (the Western Wall of the Jewish Temple, which had been abandoned and strewn with garbage under Jordanian/Palestinian occupation). Finally, Jordanian Muslims would stop drilling holes and urinating into Jewish graves that dotted East Jerusalem. Finally, Muslims would stop deliberately building hotels–like the Intercontinental Hotel in East Jerusalem–on top of Jewish graves. * The Six Day War showed the Muslim world that Israel wasn’t going to take it anymore–the terrorist attacks (which began well before it reclaimed Jerusalem and the so-called “West Bank” in 1967). They defeated Muslims from several countries who supported, enabled, and participated in this war. Egypt was decimated. Israel showed the Jihadists that the West (Israel is “the West” in the Mideast) would fight back . . . and win. The Islamic world was humbled, the way it should be today, but unfortunately isn’t. Today, Israel is doing self-containment–with Gaza, the West Bank, the fence, the Golan Heights giveaway talk–on behalf of its enemies. * It was an important victory against anti-Semitism. Jews gained a respect in the world for fighting back and not embodying the wimpy, weak stereotype of bespectacled, limp intellectuals who made an easy punching bag. Israeli generals like Dayan, Rabin, and Sharon were tough . . . in those days. They won, not by giving land to the aggressors in exchange for a meaningless piece of paper and a photo op at 1600 Pennsylvania Avenue, but by taking land back from aggressors who illegitimately occupied, attacked them from, and desecrated holy sites and graves from that land. We are tired of fighting, tired of being courageous, tired of victories, tired of defeating our enemies. The country and its leader no longer have the will. And that’s the complete battle against Jihad and Islamism. * It showed us–is still showing us– there is a double standard in operation to this day. The doctrine that “to the winner go the spoils of victory” simply doesn’t apply to the Jews or to Israel. Israel won the war. It defeated its warring, aggressive, Islamist neighbors. Yet, it is giving back the spoils of victory, piece by piece all the time, in exchange for meaningless pieces of paper, or even–as in the case of the absurd Gaza retreat–nothing at all, except Kassem rocket attacks on its people in working class neighborhoods, like Sderot. Yes, times have changed. 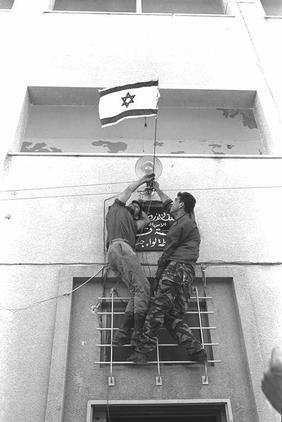 On June 8, 1967 Israeli soldiers were posting the Israeli flag over the police station in Jenin (see photo above). Today, they search house-to-house in an attempt to show civility against murderous terrorist thugs. And unfortunately, the courageous, awesome 1967 victory in the Six Day War is now being decried in stark revisionist “history.” Last night, your tax-funded PBS a/k/a “Palestinian Broadcasting System” had a two-hour propaganda piece, filled with lamentations by has-been Muslim leaders and representatives . . . and a tiny few Israelis, many of them lefties, too. The “objective” media representative providing commentary was Abdullah Schleifer. But Marc Schleifer–a Marxist Castro supporter and enabler who made many sojourns to Cuba–is an atheist Brooklyn-raised Jew who converted to Islam and edited “Palestine Today” in 1967 from the comfort of East Jerusalem, Jordan. He lives with his Muslim family, today, in Egypt. Yup, that’s PBS’ “objective media observer” for you. Israel should never have gone to war against its neighbors who were already attacking it. Nope, despite their promises to wipe the country off the map, Israel should have just lied down and enjoyed it, say PBS and the many other Mainstream Media revisionists, today. Yes, tragically, Israel’s tremendous 1967 victory over Islamists and anti-Semites–and America’s War on Terror–are now being transformed into defeat on the airwaves and beyond. Will we–like Israel did last summer and is doing now in its push to give the Golan Heights to terrorist Syria–continue to lose the war? Will America be like the strong Israel of June 1967 or the psychologically weak Israel of June 2007? Right now, it’s the latter. Until–and IF–we wake up. Read a great synopsis of the Six Day War by Mitchell Bard. The authoritative history of the Six Day War was written by the brilliant Michael Oren: “Six Days of War”. It’s good reading. June 5, 2007 — Forty years ago this morning, Israel launched a pre-emptive strike that decimated the Egyptian Air Force, destroying 300 planes and paving the way for the remarkable six-day victory on three fronts against the combined armies of five Arab states. It was one of the most amazing military campaigns in history and it remade both the map and the political landscape of the Middle East. . . . Despite the effort of revisionist historians to rewrite the events of that week, one thing is clear: The Jewish State went to war against an enemy openly pledged to its destruction. Indeed, Egyptian President Gamal Abdel Nasser had promised his people that “the battle against Israel will be a general one, and our basic objective will be to destroy Israel.” Israel could not afford to wait until it was attacked, as both Egypt and Syria had massed troops and tanks along their borders. Israel’s victory was staggering: It captured the Sinai and Gaza from Egypt, the Golan Heights from Syria and the entire West Bank and east Jerusalem. . . . Meanwhile, what Israel made clear 40 years ago – and again in 1981, when it destroyed Saddam Hussein’s nuclear reactor – is that pre-emptive warfare is not only justified, but sometimes necessary in the name of self-defense. That’s a lesson the rest of the world might want to heed these days. On the morning of June 5, 1967, a fleet of low-flying Israeli jets surprised the Egyptian air force on the ground and destroyed it. This act of military pre-emption helped save Israel from what Iraq’s then-President Abdul Rahman Aref had called, only several days earlier, “our opportunity . . . to wipe Israel off the map.” Yet 40 years later Israel’s victory is widely seen as a Pyrrhic one — “a calamity for the Jewish state no less than for its neighbors,” according to a recent editorial in the Economist. The Six Day War is supposed to be the great pivot on which the modern history of the Middle East hinges, the moment the Palestinian question came into focus and Israel went from being the David to the Goliath of the conflict. It’s a reading of history that has the convenience of offering a political prescription: Rewind to the status quo ante June 5, arrange a peace deal, and the problems that have arisen since more or less go away. Or so the thinking goes. Yet the striking fact is that all of Israel’s peace agreements — with Egypt in 1979, with the Palestinians in 1993, with Jordan and Morocco in 1994 — were achieved in the wake of the war. The Jewish state had gained territory; the Arab states wanted it back. Whatever else might be said for the land-for-peace formula, it’s odd that the people who are its strongest advocates are usually the same ones who bemoan the apparent completeness of Israel’s victory in 1967. Great events have a way not only of reshaping the outlook for the future but also our understanding of the past, usually in the service of clarity. “Why England Slept” was an apt question to ask of Britain in the mid-1930s, but it made sense only after Sept. 1, 1939. By contrast, the Six Day War laid a thick fog over what came before. Today, the pre-1967 period is remembered (not least by many Israelis) as a time when the country’s conscience was clear and respectable world opinion admired “plucky little Israel.” Yet these were the same years when Israel lived within what Abba Eban, its dovish foreign minister, called “Auschwitz borders,” with only nine miles separating the westernmost part of the West Bank from the Mediterranean Sea. It is also often said today that the Six Day War humiliated the Arabs and propelled the region into future rounds of fighting. Yet President Aref of Iraq had prefaced his call to destroy Israel by describing the war as the Arabs’ chance “to wipe out the ignominy which has been with us since 1948.” It is said that the war inaugurated the era of modern terrorism, as the Arab world switched from a strategy of conventional confrontation with Israel to one of “unconventional” attacks. Yet hundreds of Israelis had already been killed in fedayeen raids in Israel’s first 19 years of existence. It is said that the Palestinian movement was born from Israel’s occupation of Gaza and the West Bank. Yet the Palestine Liberation Organization was already in its third year of operations when the war began. It is said that Israel enjoyed international legitimacy so long as it lived behind recognized frontiers. Yet those frontiers were no less provisional before 1967 than they were after. Only after the Six Day War did the Green Line come to be seen as the “real” border. Fog also surrounds memories of the immediate aftermath of the war. To read some recent accounts, a more sagacious Israel could have followed up its historic victory with peace overtures that would have spared everyone the bloody entanglements of its occupation of the Sinai, Gaza, the West Bank and the Golan Heights. Or, failing that, it could have resisted the lure of building settlements in the territories in order not to complicate a land-for-peace transaction. In fact, the Israeli cabinet agreed on June 19 to offer the Sinai to Egypt and the Golan to Syria in exchange for peace deals. In Khartoum that September, the Arab League declared “no peace with Israel, no recognition of Israel, no negotiations with it.” As for Jewish settlements, hardly any were built for years after the war: In 1972, for instance, only about 800 settlers had moved to the West Bank. It’s true that the war caused Israel to lose friends abroad. “Le peuple juif, s?ªr de lui meme et dominateur” (“the Jewish people, sure of themselves and domineering”) was Charles de Gaulle’s memorable line in announcing, in November 1967, that France would no longer supply Israel militarily. Such were the Jewish state’s former friends. . . .
Then again, when the sun rose on June 5, 1967, Israel was a poor, desperately vulnerable country, which threw the dice on its own survival in the most audacious military strike of the 20th century. It is infinitely richer and more powerful today, sure in its alliance with the U.S. and capable of making concessions inconceivable 40 years ago. If these are the fruits of Israel’s “Pyrrhic Victory,” it needs more such of them. AMEN. And . . . if only. While the 6 day war precipitated his break with Israel, it had been several years in the making before that. Basically it started when the Algerian War ended in 1962. France was inching away from its alliance with Israel for several years after that, with the 6 day war the final event in a series of distancing steps. 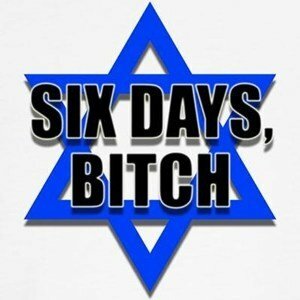 **** UPDATE: A great Six Day War compendium site is The Six Day War Project. Check it out! Debbie, this is indeed a great anniversary, and one of the few times in world history that Muslims got their asses handed to them. Too bad that today’s leaders of Israel are a big embarrassment in comparison. I fully agree that Israel should have tossed out all Muslims out of the conquered territories. To everybody who harps on the ‘occupation’, the entire Middle East – north of Saudi Arabia – is occupied. Those lands were not Arab: they were Byzantine, Assyrian, Kurd, Persian, Egyptian, Phonician, Carthegian and so on. The Arabs conquered them and annexed them. Throughout history, territories have changed hands through conquest. Otherwise, the Arabs should all withdraw to Saudi Arabia, and what’s more, Medina, which was Jewish, should be handed back to Israel. Poland should shift eastwards, annexing much of Belarus and giving back East Prussian territory to Germany. And so on. One of the biggest shames was Israel falling for Egypt’s con job, and giving back the Sinai: if anything, they should have annexed Sinai, Gaza, Judea and Samaria, just like they did the Golan. And make it clear to their neighbors that they weren’t getting it back, no matter what. Even if Israel wanted to toss the Muslims out,which I doubt they really wanted to do anyway,the whole world including the US would have united against them doing it and would have used sanctions to literally starve Israel to death. Not only has the phony Trump “delayed”(broken)his promise to move the embassy to Jerusalem,he continues American policy of not recognizing Jerusalem as part of Israel. A couple of months ago some right-wing Israeli websites pointed out that the US Consulate of Jerusalem was virtually Jew-free. They also mentioned the official website of the consulate was also virtually Jew-free. They were right.After reading their complaints,I checked the website out for myself,I could swear I was was at the website of the PLO. Israel was barely mentioned,yet they had articles of vast importance such as bake-sales being held by some pali elementary school somewhere. This must be part of that swamp that Trump drained. I don’t really know what to say, except I’m typing and posting, so obviously, I have something to say. I was about 10 1/2 years old when this happened. The memories of the slaughter of Jews, the shock of the Holocaust, were still fresh in every adult’s mind. Jews in New York were determined to not see that happen again. The memories of The Great Depression, and how every day life in America was a chore just to survive, were also still quite fresh. My Jewish mother and many others in New York cringed, fearing the worst, and that it would spread worldwide if Israel lost. Then relief and joy, Israel won, and showed incredible might and resolve. But “The Greatest Generation” is almost completely dead now. We, The Ungrateful Baby Boomers, many of us anyway, did our best to muck things up now, didn’t we? And every generation after has taken us up on our rebellious nature. But we didn’t mean for this to happen. To see history revised, a culture turned over like a pancake, and instead of truth, madness and lies prevail. In just half a century. As a result, I’m astonished, and old. I tasted the America that was, and lived to see the America that emerged. We are living in the America that already is no more. A great day but like the battle of Masada, Jews are their own worst enemy. They think by being nice will curry favor with their enemies. In 1967 they should have removed the al aqsa mosque and any Muslim references including the people. Now the liberal media and others keep saying third holiest city to Muslims. Funny how the evil prophet Muhammed broke treaty with Jewish tribes of Medinah and slaughtered them. No mention or remnants of Jewish life there. Yet today Jews should give up more land after winning and Jews get nothing. I wonder how Muslims would feel if Jews kept saying Medinah is occupied territory and the Muslims should give half back to Jews? Alfredo and Infidel took away my thunder! They’re right. I was in college in NJ within the NY Metropolitan Area. There was great support for Israel in the media and public. Israel was surrounded, out-numbered, out-armed, and it looked like Israel would have been over run. It was a miracle they won. Compare that coverage to the MSM’s coverage of Israel today. If there were more honest coverage of Israeli events and if the history of Israel were taught, there wouldn’t be so much anti-Israel sentiment in this country. I want to thank Debbie for this article, as of the writing of this comment, I have seen or heard nothing about it (the 6-day war) from the media. Unfortunately in today’s world, history is not taught and/or re-written to fit an agenda. Therefore, one cannot learn from history, or even be aware of historical events and what they meant. Just speak with a college or HS student. They cannot even find the US on a map! This is one of the finest articles I’ve ever read. Thank you for reminding everyone of the attacks against Israel leading up to the six day war and the armies poised at its borders. It’s very sad to see what’s happening now because of leftists. Thank you again for this amazing article. I’m saving it in my personal notes files. This is an extraordinary and outstanding article. The only thing I’d like to add here is to say that while Saudia Arabia, Iraq, and Kuwait were helping Israel’s enemies by providing arms and even troops to Egypt, Jordan, and Syria, in Israel’s time of need, Israel’s “friends”–President Lyndon Johnson and President Charles de Gaulle–declared arms embargoes against Israel at the outset of the 6-Day War (though France did continue to provide spare parts for the French military hardware that Israel’s army was using). My understanding is that by the mid-60s, French replacement of Israeli spare parts was sporadic and unreliable. While they did not completely boycott the replacement of spare parts, they had become undependable in this regard. I love Charles DeGaulle’s statement about Israel. Maybe if the Frogs had fought in 1939 and 1940 as the Israelis did in June, 1967, Nazism and Hitler would have died out quickly. CP, do you mean when de Gaulle described Jews as an “elite people, sure of themselves and domineering” and Israel as an “expansionist state” after Israel had launched the 1967 war against his wishes? On the plus side of de Gaule’s actions, France’s embargo against Israel did compel Israelis to draw on their own innate strengths and drives and helped to spawn Israel’s high-tech revolution. See this link for a recent story about that: http://www.jpost.com/Opinion/Editors-notes-De-Gaulle-and-Israels-technological-revolution-494578. In 1936, when the Rhineland was occupied. And what have we learned after more than 1300 years of Islamic torture, murder and terrorism ? You either confront them in a war of absolute annihilation or result in their continued torture, murder and terrorism.